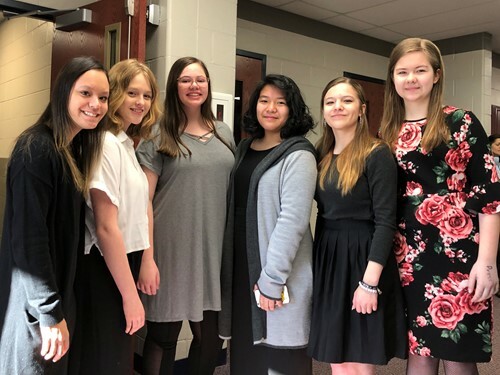 Congratulations to the Springboro Junior High Choir students who competed at the District 13 OMEA Solo & Ensemble Contest at Clinton-Massie High School. All vocalists received the highest rating, a superior. Soprano soloists were Alena Marcum & Caitlyn Laws. Alto soloists were Gracie Ramos, Shelby McCoy, Olivia Powell & Trinity Baumann. The 3rd period SA Ensemble was comprised of sopranos Allison Ridley, Maddie Sandner, and Brooke Sheese. Altos were Johnna Ford, Gracie Ramos & Hallie Shirley.